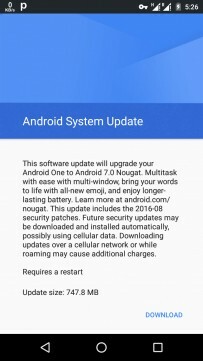 Google rolls out Android 7.0 Nougat over-the-air update for Android One devices. A reader of ours points out that the Cherry Mobile G1 is one of the many Android One phones that has the update on queue. Similarly to what happened with Android 6.0 Marshmallow, Android One devices receive the latest software update the day after Google releases the Nexus factory images. If you have an Android One smartphone, we’d like to hear from you if your device has received the software update notification. We’ve got a splendid Android 7.0 Nougat review for you to check out and see all the latest features Google’s OS has to offer.